Content Hub | The five coolest gadgets you cannot afford to miss! It’s that week again for the Consumer Electronic Show (the CES), when tech manufacturers break out all of their hottest new devices to show the world where technology is going to take us over the next few years. The darling of the show, and a kick-starter sensation, the pebble watch has got me pretty excited! The device uses an e-ink screen similar to that used in the original Amazon kindles, meaning that it can change its display scheme to whatever you choose, from a traditional clock face, to a digital display, to a trendy binary display – whichever one you choose. The device will also be able to display your social updates, and contains sensors and Bluetooth connectivity that will eventually allow you to integrate and control your other devices. Set to retail for around $150, the pebble watch is likely to be much cheaper than many other trendy timepieces, yet it has a lot more to offer. It’s the nineties again – Virtual reality that works! It’s time for those dorky VR headsets again. The difference, though, is that this time it seems they are really wowing the critics. The new Oculus Rift headset is impressing show attendees with its ability to update and move naturally in response to users movements, rather than demonstrating the lag that characterised earlier attempts making the experience far more natural and immersive, drawing the user into the experience rather than constantly reminding them that it’s artificial. A fridge that might be smarter than you – and worth more! The $3500 price tag on LG’s new Smart fridge might be a little off putting for some, but this is a fridge that has a mobile app which can help manage your power usage and shopping list, dispense chilled beverages and allow you to select recipes and then tell you what to buy. Pretty smart, huh? It may or may not help you manage your finances to help you make the payments on it, but I’m guessing not! 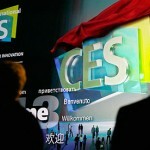 Samsung has taken the opportunity to display their brand new flexible smartphone displays at the CES show. These look rather impressive, but it’s not clear yet as to their actual ability, especially given that the rigidity of some key smartphone components mean that this type of flexibility will be difficult to apply to the entire phone. Another interesting innovation in smartphone displays comes from Tactus’s mighty morphing tactile display, which allows a touch screen to form actual physical controls under your fingertips. Samsung has announced a rather cunning feature on their 3D TV’s that allow multiple viewers to watch completely different things at the same time, in 3D no less, potentially making the war over the remote a thing of the past. And let’s not forget the new innovations that may soon allow you to control the television with nothing but the power of your mind meaning that you may soon not even need to expend the effort involved in pointing the remote at the telly. Of course a lot of the buzz at the show is about the prospect of new “Ultra” HDTV’s but there is currently some scepticism whether the technology can be brought down to affordable levels for the public any time soon. Do any of these offering get you excited? Can you see yourself buying any of these devices if you could afford to?